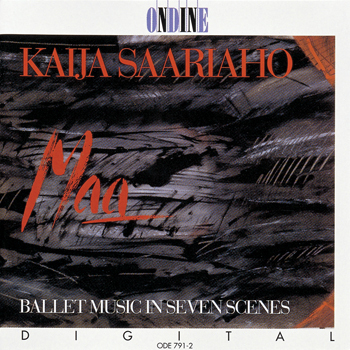 This CD features Finnish composer Kaija Saariaho's ballet music Maa, a commission from the Ballet of the Finnish National Opera to a choreography by Carolyn Carlson. Mixing and manipulation of sounds was carried out in the Finnish Radio Experimental Studio. The work's first performance took place on October 31, 1991, at the Finnish National Opera. Maa ("earth" / "land" / "country" / "world") has an abstract, non-narrative plot which is built around thematic archetypes such as doors, gates, stepping into new worlds, journeys and the crossing of waters. This recording was made by the Finnish Broadcasting Company YLE in December 1991 and March 1992, in close collaboration with the composer.